AFL Sydney is pleased to announce that the 2017 Round 13 Women’s Rising Star is Courtney Richmond from the Western Magic. Courtney joined the Magic this year and has played 9 games so far. 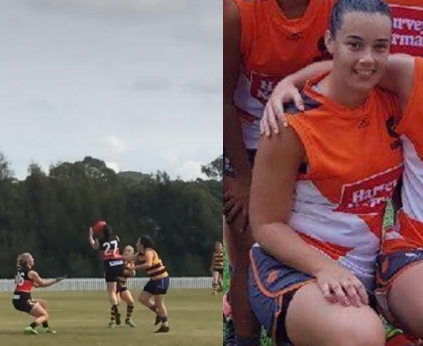 Courtney had never played AFL before coming from Netball where she enjoyed many years as a rep player and was recently chosen for the NSW U21 squad. Courtney showed from her first game that she is highly competitive and enjoys the physical contact not allowed in Netball. Courtney was chosen in and played for the Harvey Norman All Stars team in an exhibition game against the NSW U18 team. Since that game in May Courtney has found her home across the half back line and was amongst Magic’s best on ground against Newtown earlier in the season. Courtney’s ability to read the game and anticipate the opposition’s attack has seen her top our intercept marks and tackles. In counter attack her kicking continues to improve and she is now regularly hitting targets to put us on attack. AFL Sydney congratulates Courtney on her Round 13 Rising Star nomination.